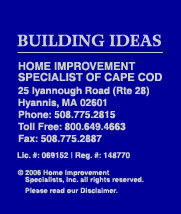 HISCC was founded in 1977 and has served thousands of customers on Cape Cod and Southeastern Ma. Many of these customers are repeat clients who have developed a trust based on the positive experience they have had with HISCC. This is the foundation upon which HISCC has built it's business. It is no wonder why so many of our clients have hired HISCC back to their homes 3 and 4 times. We believe it is our dedication to serving our clients needs that nurtures a lasting relationship in which our customers invite us back for their next project. We never forget we are working in your home.